Thank you, Holy Father! Now, is there any way you can make ’em listen to you? Christian Order I used to subscribe. Excellent articles! Seattle Catholic Archive of articles and news – Excellent! [Living] A Catholic Life neat pictures; interesting info; supports the TLM! The Tenth Crusade Meet our new neighbor, carrying on the 10th Crusade on the blogosphere.. Fight on, Carol! Catholic Tradition – galleries beautiful Catholic imagery – Browse the entire site! 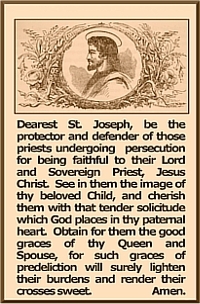 Saint Joseph Album Enjoy this beautiful dedication! Ars orandi: The Art and Beauty of Traditional Catholicism Beautiful images, and oh, so Traditional! [Join the] Universal Living Rosary Association – In honor of St. Philomena , for the Triumph of the IHM !